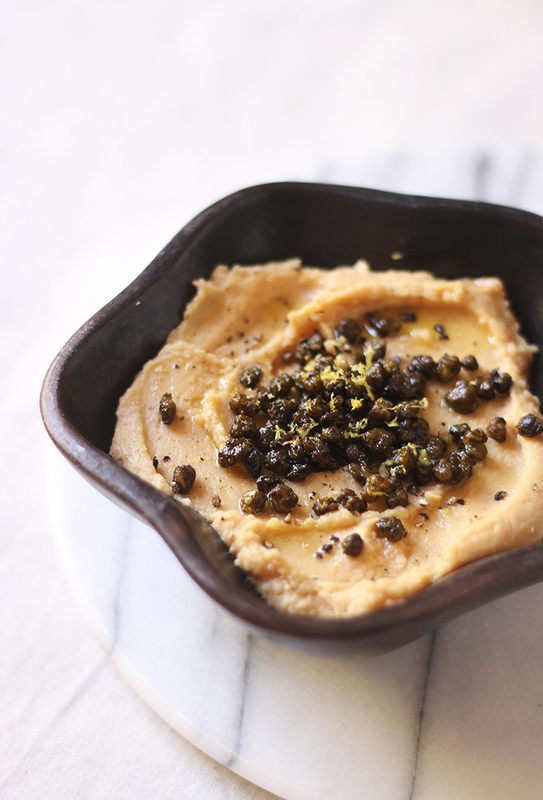 While there are many different ways to build on hummus to change it’s profile and jazz it up a little, I thought today I’d share a recipe which uses a slightly different base and adds a topping to make it a little different. I often make up a big batch of homemade dip of a Sunday afternoon to have on hand for snacks and meals throughout the week. Dips are a great way to add a little extra flavour and texture to another dish, and there are many ways you can use them. This will depend to an extent on what type of dip you have made, but think about adding a dollop of dip to serve alongside your favorite salad, soup or stew; enjoy as a snack with some vegetable sticks or wholegrain/sseded crackers; slather on some bread (traditional or paleo-style); or serve in pita with patties such as falafel. 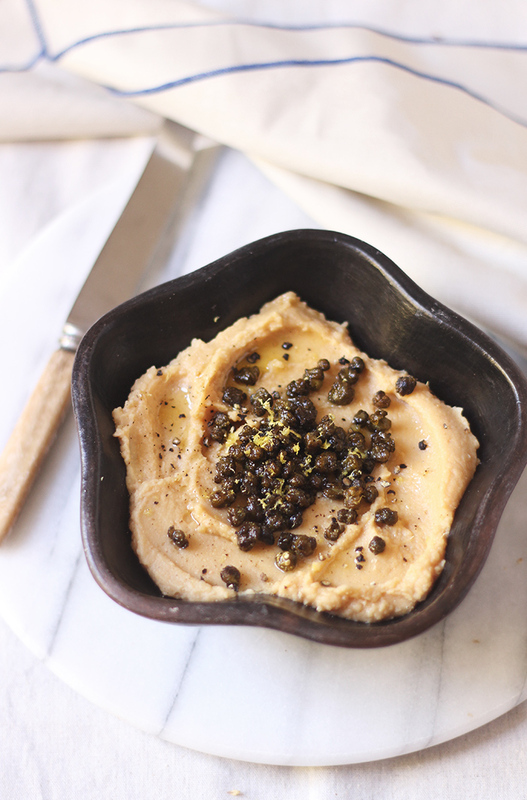 Dips can be a great way to bump up the nutritional profile of a dish, with hummus-style dips being a great way to add some additional protein and fiber. They can also be incredibly economical – if you cook your beans yourself and add a few cheap seasonings, a cup of homemade dip can come in at under a dollar. Even using canned beans, you’ll still come out with something that’s not going to break the bank in any way. This recipe here is a great way of making a delicious dip with whatever ingredients you have on hand. You can use any type of white bean for the base – I’ve used a combination of chickpeas and cannellini beans, though you could also use other white beans such as great northern or navy beans. You could also change up the spices a little depending on what you have on hand. I’ve used cumin, but you could also substitute paprika, ground coriander, sumac or fresh herbs. 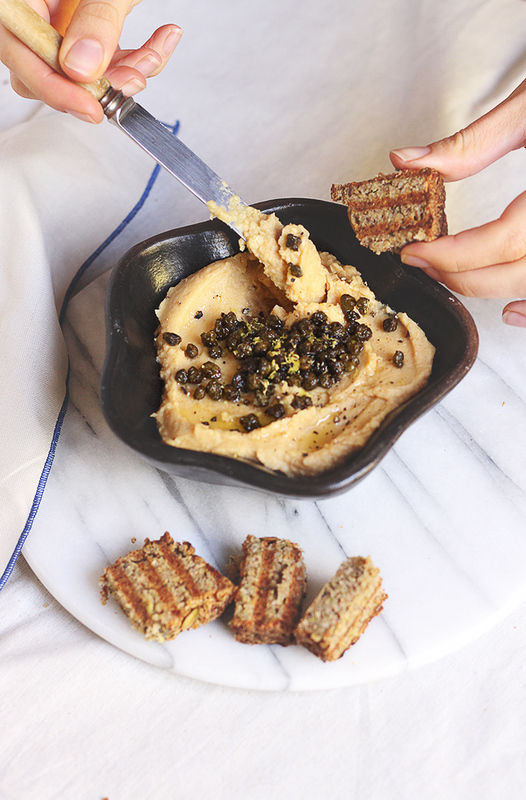 I fried up some capers to add some extra flavour and texture, but if you didn’t want to go to the extra effort, the dip is perfect in its smooth and creamy simplicity on it’s own. And if you’re after an extra serving suggestion – this dip also goes really well with the Savoury Zucchini + Quinoa Loaf I posted earlier in the week. Heat a frypan over high heat with 2 Tbsp olive oil. Place the drained capers in some paper towel and gently press out and extra liquid. When the oil is hot, add the capers and the salt. Fry until crispy and browned, stirring frequently to prevent burning, around a minute or two. One they are nice and browned, remove from heat and allow to cool. To make the dip, drain the beans, but reserve the canning liquid to use in the dip. Add the beans, garlic, lemon juice, seasonings and 1 tablespoon of the canning liquid to a food processor and process until smooth and combined, around two minutes. You will need to stop a few times to scrape down the side of the processor bowl and you may also need to add additional canning liquid - do so one tablespoon at a time. Once smooth and creamy, add the dip to a serving bowl and add the capers on top with a drizzle of oil and a little freshly grated lemon rind. Homade hummus and dips are so delicious. I love all of your tips for adding extra flavour and variation. Because you are so right – dips are thebest snack ever! I love the crispy caper idea, what could be better?! Bean dips are such versatile spreads to have on hand and this is a great base recipe you could take a million different directions. Place the drained capers in a come paper towel?? ?